We all know what MovNat is – what incomparable effects it delivers; how deep it dives into human needs and capacities; how much it can transform you positively inwards and outwards; and even how it transforms the world around the practitioner through effecting his/her awareness of the environment that surrounds us all. As a Team Instructor and someone who is digging deep into this method, living it’s philosophy, and being very active in promoting it’s message I encounter all sorts of people and communities whom ask what MovNat is and what differentiates it from other systems. After writing the first book in German language on MovNat, I’m getting these questions more and more. So I’m writing here about my personal opinion about what MovNat integrates and expands upon to form a truly revolutionary fitness and physical education system. First let’s talk about the current environment of the industry. After decades of a rather simple world of fitness, sports, and recreation the fitness whole industry is undergoing a uprising of sorts. It’s a Movement called Movement. 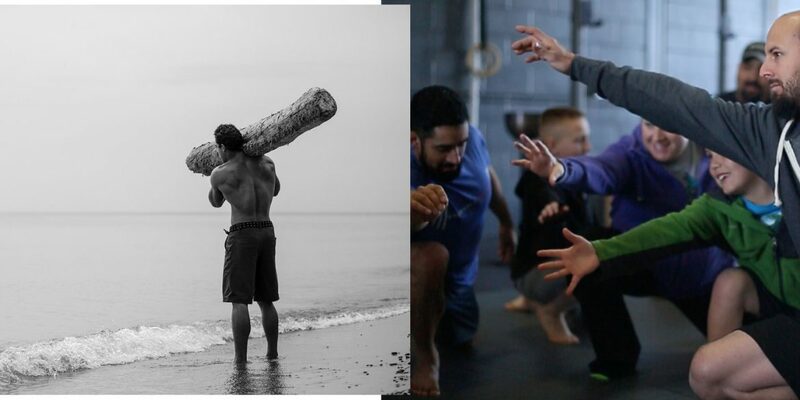 Practical, natural, cooperative, artificial, artistic, functional, corrective, evolutionary, primal, paleo, spiritual, play, fight, arboreal… New concepts, methods, systems that break the mold and find roots in gymnastics, dancing, martial arts, children, ninjas and animals. It seems that a long blocked freedom to move is blossoming in an awakening of possibilities. Interesting enough, the change of the times stand on chaos. At the beginning of something new there almost must be chaos. Chaos to end the old, which has become a deadlock, and give birth to the new. To reset and grasp a new opportunity – the overcoming of the obsolete, the outdated. The new is never born out of the blue, it’s always an improvement of something previous. I don’t know what exactly influenced Erwan, or what exactly he had in mind as he created MovNat, but it turns out it has a lot in it which both feeds the needs modern fitness system’s needs while also having an profound effect on health. It is not artificial, nor trivial but it is the root of the development and ongoing refinement of human movement. MovNat (X) = Natural/Practical Movement (T) + Biological/Evolutionary needs (E) + Progressive/Scalable Education System (P) + Connecting Body & Mind (M) + Transferable to any real world situation (L). The “T” in the formula stands for the Natural/Practical characteristic of MovNat. In every decision someone makes while trying out some new fitness system, this should be the most important one. If a method is going to maximize the health of the human organism it must satisfy it’s biological needs (E); not just feed the competitive spirit or nurture not only the superficial parts of the body. It should offer progressions and scalability to be open to everybody (P). It should be able to reconnect the uncountable parts of the organism, the bones, muscles, fascia, nervous system, glands, skin, senses into a well working mind and body unity to build up self-empowering entity (M) and should be directly transferable into real life situations (L). But Wait. Is MovNat really New? Admittedly, MovNat itself isn’t totally “new.” It draws inspiration from George Herbert’s Methode Naturalle. But it also isn’t anything close to a carbon copy of what Herbert created. First, if you look at the formula, what is the difference between MovNat and Methode Naturelle? What are intentional ingredients in MovNat is something which comes in the wake of Methode Naturelle. Methode Naturelle consists only of the T and the E. “Be strong, to be use useful” says a lot about the character of Methode Naturelle. There is little fine tuning and there is planned training and conditioning in natural/practical movement. Methode Naturelle itself doesn’t take the modern level of deconditioning and mindlessness of humans into account, which needs a much more sophisticated approach to bring him/her back to strength and usefulness. P = Progressive Education System (accessible to everybody): This factor can be found in any professional sports, and it follows the rule of the competence continuum in a progressive acquisition of skills, as well as in screening tools like the Functional Movement Screen. “First move well and then move often” is one phrase the FMS uses to define itself. MovNat is all about working on efficient technique through a step by step approach. The corrective takes place by building up physical competence by working in volume, intensity and complexity not in a functional way, but in a practical way. Like the cooperative concept of MovNat and FMS, Exploring Functional Movement, has tried to show, is that natural movements are as suitable to correct motor control and functional dysfunctions and asymmetries than functional exercises. You think about the movement getting from point A to point B. You actually do the movement by leaning forward and bringing one foot to the front. You adjust yourself after feeling whether this was good or bad. This permanent interaction between the mind (thinking and feeling) and the body (sensing and moving) is what evokes the self-image, self-consciousness, self-improvement and self-empowerment on the way to physical competence. L = Finally you get the transfer to daily life at a minimum to no time expenditure if you just change some positions, movement and through not doing it the conventional style but the MovNat-style: move, think, sense and feel different. So Methode Naturelle is at first glance very similar to MovNat, but MovNat took some skills Hebert collected and transferred it into a very different system. MovNat consists of not only a good marketing of running barefoot through the forest, climb on trees or jump from stone to stone. Like Methode Naturelle and every other system not only in fitness, sport or movement, but in any respect of the human possibilities, MovNat was not born out of the blue and draws its method from much more disciplines; or at in many instances arrives at overlapping conclusions with the best of them. Did George Hebert create something new? Take a look at the history of physical education and you will see the how much previous people wrote and practiced on the same thoughts. The direct influences into Methode Naturelle are for example to name a few: Francisco Amorós, Friedrich Ludwig Jahn, Dr. Paul Carton, Georges Demeny. As you can see MovNat is one of the few systems which integrates almost everything humans need. Ok, it is not the direct way into enlightenment, but it is the system to build up the capacities for the body and the brain in everybody in a modern and holistic style. Its truly a revolutionary method for approaching health and fitness. Bernd Reicheneder is a sport scientist with an emphasis on Shotokan-Karate of the Technische Universität München and holds also a degree in Classical Archaeology from the Ludwigs-Maximilian-Universität München with an specialization on Sports Archaeology. Starting in 1989 with training and finally coaching as a 2nd Dan in Shotokan Karate, Bernd also has been working in the fitness industry as coach and trainer since 2000 with a specialization on functional testing tools like Muscle Function Diagnostics and the FMS. He built up his own business and finally discovered MovNat in 2011 at a Workshop with Vic Verdier in Berlin. After running through all MovNat certifications and working his way into all aspects of Natural Movement and lifestyle he is now member of the MovNat Certification Team in the German speaking parts of Europe. Hi Sean, thanks for your comment. But what exactly do you mean? This is pure brilliance. Thank you for your work!! Thanks Skye, I#m glad you like it! Just a comment on MovNat is for everyone. I attended the Immersive Workshop last year with Mr Le Corre in NM for the reason to get some insight into the thinking and philosophy behind this type of regimen from the man himself. For me it was well worth it. The concepts were easy to understand yet challenging. The natural environment is the perfect gym, always changing yet strikingly beautiful. Thanks Tony Traver for your comment! Great tor hear that you experienced exactly what I meant! Dear Bernd, thanks for this article in which you explained that Movnat is a fitness system, teaching natural movement. We practice a lot of (isolated) techniques of human movement. What are your thought on the applications of these techniques? Would an obstacle run be such an application or trail running or arboreal exploration or roughhousing? I would appreciate your thoughts about this. Hi Bernd, how comes you as a MovNat instructor “don’t know what exactly influenced Erwan, or what exactly he had in mind as he created MovNat”? Why don’t ask him? “Parkour.net was the most credible and interesting site for those in search of anything Parkour related. Erwan still wanted to connect with the guys who were doing similar training to his despite been unsuccessful so far. Thanks for the added insight Jill! I’m pretty sure Bernd knows the history, but chose to keep it simple to stay on topic for his article. After all, no one knows “exactly” what goes through anyone’s else’s head and its difficult to attempt to in one sentence without digressing. But, if folks are interested, I’m sure Erwan would be willing to write a focused article on that topic!